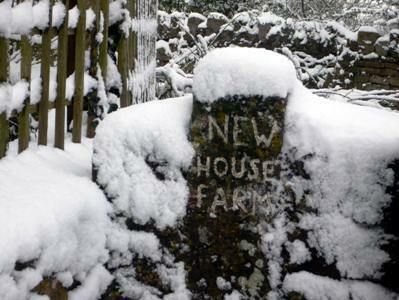 Mill farmhouse (now known as Mill House) is older than New House farmhouse. It is perhaps in origin a longhouse, that is, built to house family and animals under one roof, and was extensively remodelled early in the 17th century. It was part of the estate of the Verney family, who possessed the Manors of Tytherington and Itchington. The first recorded tenant was James Pullen, who died in 1690. That he lived at Mill Farm is shown by the inventory of his goods made at his death, in which the room-by-room listing correlates closely with Mill farmhouse but with no other house in the village. The inventory shows clearly that he was a man of substance, with four-poster beds upstairs, with curtains, the fashionable coffee-pot in the kitchen, and with social ambitions, for the will specifically mentions the Silver Cup given by 'my Lady Allington' and another from Sir Richard Ashfield Baronet. His assessment for the Poll Tax of 1673 was by far the highest in the parish. It seems likely that the family, a hundred years or so before, had joined in the prosperous cloth trade of the Stroud region. The clothiers provided the capital, undertook the preparation and the finishing of the cloth, while the wool was spun and woven by families in the village. 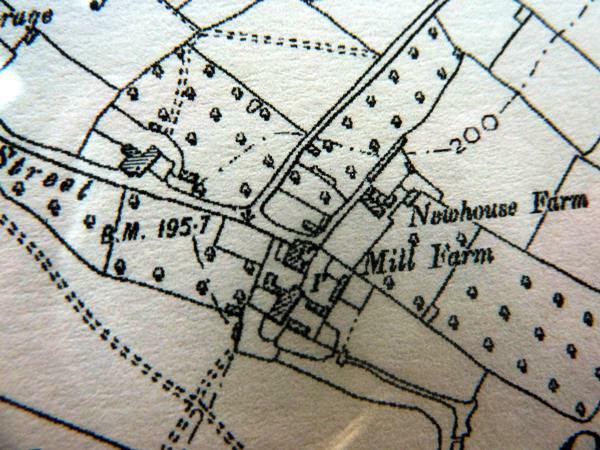 OS Map surveyed 1878 revised 1901 showing New House Farm and Mill Farm. Around 1600, many men in Tytherington were employed in weaving and by 1700 the village was still busy with cloth making as well as farming. Older maps show a layout of ponds around Mill Farmhouse similar to those at other cloth mills — a reservoir (fed by the leat along Duck Street) to store water to work the fulling hammers, and a field under the eye of the clothier — where the cloth could be dried. Many clothiers became rich; James Pullen even by 1667 is described as `Gentleman', no longer yeoman or clothier, and by the time of his death he was perhaps enjoying a comfortable retirement. His possessions were valued at £277 6s 11d, but not included was the value of a house in Tytherington which he owned. We know that a John Hobbs lived at the `Malthouse', close by in Duck Street, early in the 1600s. The Hobbs family was prominent in t area, involved in the cloth trade, farming and as landowners. It is tempting to speculate that the Pullens at Mill Farm and the Hobbs at Malthouse had co-operated as clothiers. Perhaps Mill Farm had the water supply necessary for the washing of the wool and the fulling of the woven cloth, but was itself unsuitable or inconvenient for other processes such as shearing. Was it a Hobbs who rebuilt New House Farm in the heady days of the early 1600s, as farm and home, and to provide weaving and shearing facilities to supplement what already existed at Mill Farm? New House built, did John Hobbs move from Malthouse, to be followed in turn by his son Edward, his grandson John and his great- grandson Edward, all clothiers? The initials I H carved on a beam at New House may well be those of John Hobbs (1656-1701), and is it no more than coincidence that elaborate decorative plasterwork on beams at Mill Farm is identical with that on the beams at NewHhouse? At this point, it seems fairly certain that the ownership of New House passed to Edward's aunt Mary on the death of his parents in 1701 and 1705. Mary had married William Pullen of Mill Farm, and had three sons and several daughters. On William's death, she remarried and lived at Bromwich's in West Street (now Porch House). Her eldest son John, who seems to have been somewhat dissolute, probably continued a while with the tenancy of Mill Farm. It was not long before he had mortgaged his inheritance. The middle son, William, died on the eve of his marriage. James, the youngest, in all probability moved to New House farmhouse, (vacant after the death in 1705 of his widowed aunt Elizabeth Hobbs), when he married Mary Berry in 1708; and it may well have been he who carved 'JP 1712' on a beam. James Pullen, in his will of 1690, declares that he and his neighbour Edward Hobbs were 'great friends' and this perhaps endorses the suggestion that the Hobbs and the Pullens had worked together through the 17th century in the making of cloth in Tytherington. But this was the peak century of prosperity for the cloth industry in these parts outlying from Stroud. The Hobbs family, associated with Tytherington and Itchington since at least 1327, was moving away. The Pullens were reverting to farming; they continued at New House for another hundred years, until in 1822 the heiress married a Cornock, while another branch of the family at about the same time moved to Itchington and is farming there still.